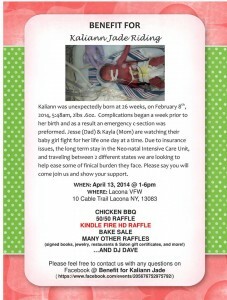 Kaliann was born at 26 weeks, on February 8, 2014 at 5:48 in the morning, weighing just over two pounds. 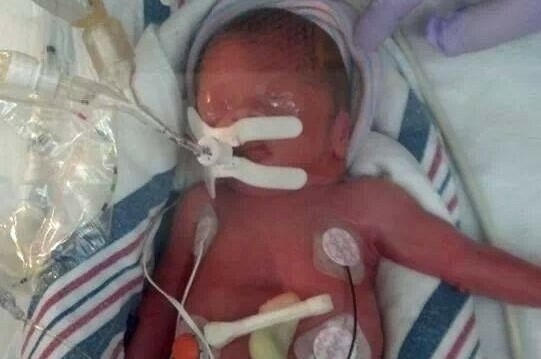 Complications arose a week prior to the delivery and as a result an emergency c-section was performed. 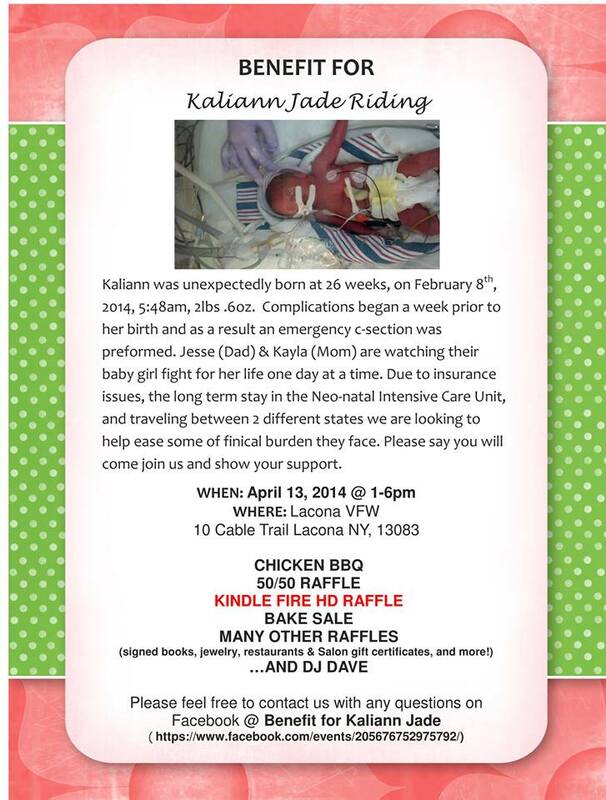 Jesse and Kayla (mom and dad) are watching their baby girl fight for her life one day at time. Due to the being in the middle of a move, the long hospital stay for mom and baby, and commuting between two states, and insurance issues, we are looking to ease some of the financial burden for them. In October of 2012 Jesse and his wife, Kayla, and Koda (their baby boy, German Sheppard) moved from Upstate, New York to Chattanooga, Tennessee to begin a new adventure in their life. They were excited to see what life had in store for them. A year later they found out they were about to embrace one of the greatest adventures in life. They were pregnant. A baby girl would be added to their little family. Kayla’s due date was May 10, 2014 and Jesse was offered more pay for his job if he transferred to Alabama. After contemplating the move, they decided it was a good idea. They began to look for a new place and packing up their house in December. Their lease was up in 30 days. Everything was going smoothly. Little did anyone know their journey into parenthood would begin much sooner then they expected. As Kayla was in the hospital, Jesse packed up the house and hurriedly found a new place. Jesse was able get everything moved with help from our cousin, Mitchell. After a 2 and 1/2 hour drive to the new place they were moved. But, Saturday morning Jesse got the call that Kayla had to have an emergency cesarean. Now, Kayla is staying in Chattanooga as Kaliann is in the Neo-Natal Intensive Care Unit and Jesse travels back and forth every weekend from Birmingham, Alabama, watching and waiting for the baby girl to grow strong enough to come home. We now want to help ease some of the financial burden by showing our support from afar. Please, say you will join us.